May is officially here across the Mid-South and Mother Nature may have finally snapped out of her early spring funk. Warmer temperatures, sunny skies, and occasional rumbles of thunder are in the forecast for your week ahead. But not to worry, we start off this week by walking on sunshine. After a chilly end to last week, temperatures have warmed up nicely across the metro to start the new work week. Expect that pattern to continue into Thursday with highs reaching the mid 80s, overall running about five degrees warmer than average. Gone are those chilly nights too, with lows this week mostly staying in the mid 60s. What is keeping us warm here across the Southeast? A ridge of high pressure remains over most of the central United States, and with little movement out of a cut-off low centered in eastern Canada, the overall upper air pattern is pretty jammed up. This is the atmosphere's version of a traffic jam, though it resembles one more likely seen in Los Angeles or New York than Memphis (unless you happened to be westbound on I-40 out east this morning...). 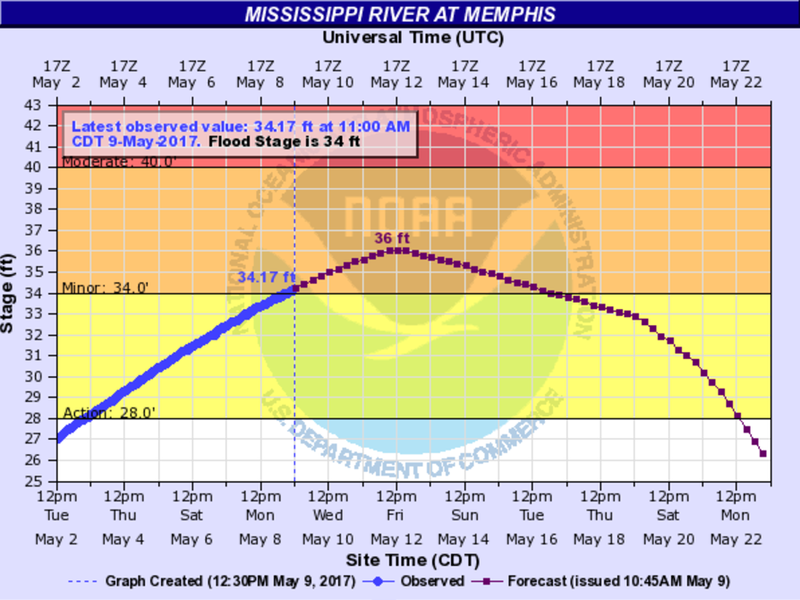 The Mississippi River as observed in Memphis reached minor flood stage on Tuesday morning. It is expected to crest over the weekend. 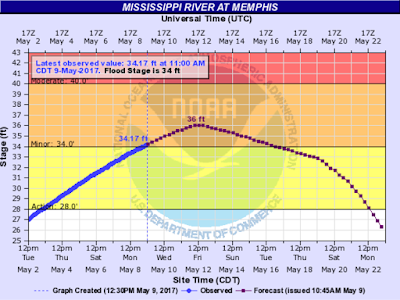 The big weather story grabbing the headlines early this week around Memphis, however, is the mighty Mississippi River. The river reached flood stage of 34 feet early on Tuesday and is expected to keep rising slowly. It should peak at around 36 feet when it crests on Saturday. Most impacts are felt inside the levees on the Arkansas side of the river with farmland covered by water. It'll drop back below flood stage by the middle of next week as it slowly recedes. By Thursday, the ingredients in the atmosphere get moving again, as an upper level trough digs into the Mid-South. 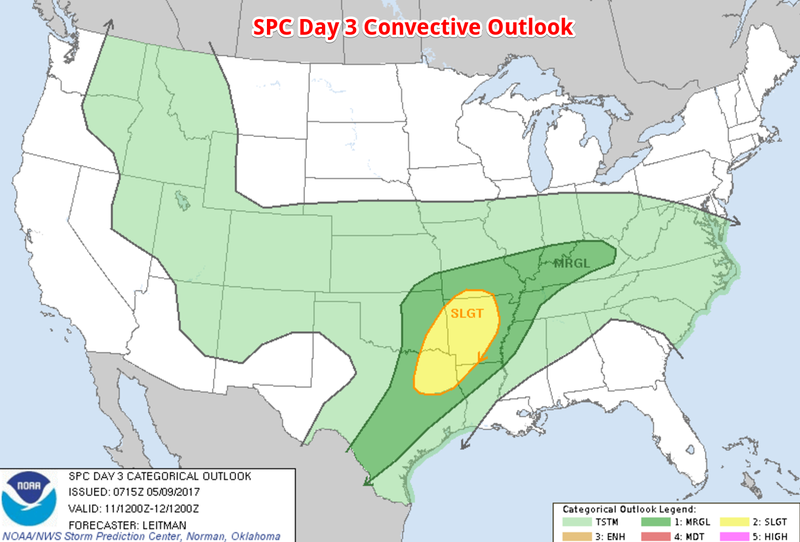 This will bring the chance of showers and thunderstorms into Memphis by Thursday evening, with a marginal (1 out of 5) chance of these storms being severe. The rain chance continues to build into Friday morning, but most of the precipitation is expected to exit the region by mid-afternoon. The Day 3 Storm Prediction Center (SPC) Convective Outlook shows a marginal (1 out of 5) chance of severe weather near Memphis on Thursday. Once the wet weather clears out of our area on Friday, the coming weekend may resemble much of what we saw to start off May. With sunny skies returning for Saturday and Sunday, temps will rebound from the cool off on Friday into the mid to upper 70s. It'll be a perfect weekend to go check out the International Salute to Colombia, all part of the Memphis in May festivities, as well as the Memphis Airshow, which has announced that not one, but TWO jet teams - the USAF Blue Angels AND the Canadian Forces Snowbirds - will be performing Saturday and Sunday in Millington! Be sure to stay on top of all the weather this week around the Mid-South by checking us out on social media, following us on Facebook and Twitter. 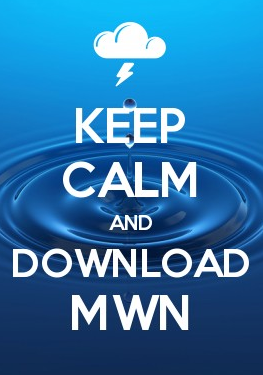 Also, download our app from your app store to keep tabs on our human-powered MWN forecasts. Enjoy your week, Memphians!